Sign Language Network of KY (SLNKY) is a multi-faceted sign language interpreter referral agency based in Lexington, KY. We take sign language interpreting requests 24/7, and provide ongoing services to Deaf and Hard of Hearing people in numerous businesses and organizations around the state. Just a few of our areas of specialty are included below. Under the Americans with Disabilities Act, enacted in 1992, most organizations are now required by federal law to provide interpreting services as necessary to ensure effective communication with deaf and hard of hearing people. In other words, when interpreting services are necessary, it is the service provider’s (e.g. lawyer’s, doctor’s, hospital’s, state agency’s, educational institution’s, court’s) responsibility to secure and pay for these services. Sign Language Network of KY(SLNKY) is happy to assist you with finding a qualified interpreter that best fits your specific need. 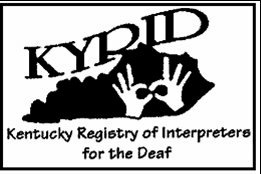 All of our interpreters are licensed by the State of KY, under the governance of the Kentucky Board of Interpreters for the Deaf and Hard of Hearing. All interpreters are members of the Registry of Interpreters for the Deaf, and adhere to the RID Code of Professional Conduct.